Raven: Mac browser turns sites into apps but is it too different? A new browser for OS X devices called Raven has been launched today and it stands out from the likes of Internet Explorer and Google Chrome because it turns your favourite sites into easily accessible, dedicated apps. We can’t work out whether this will be really useful or a little unnecessary quite yet. 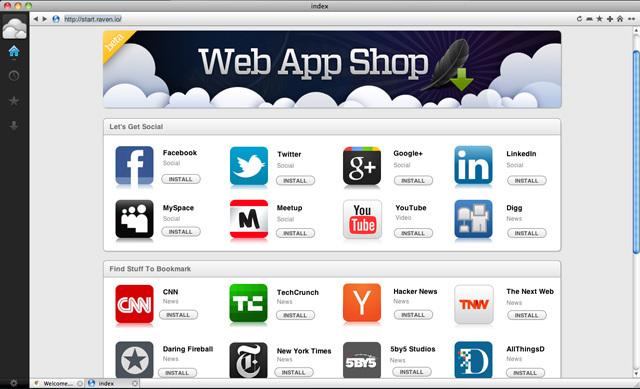 You start off by visiting Raven’s built-in app store and install the apps you use the most, so there are a few samples to choose from at the moment, like Facebook, Twitter, New York Times and Flickr. These then appear in your sidebar and clicking on them reveals shortcuts to specific areas and pieces of content. A lot of effort has clearly been put into Raven’s unique user experience and basing everything on apps is an interesting approach I’m sure some people will love. But, is it a little too different to convert the masses? Will Sean Parker&apos;s new Chat Roulette-inspired startup Airtime be a success?